Uniquely quilted on both sides. 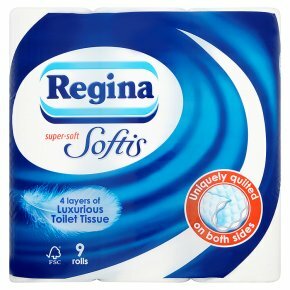 4 Layers of luxurious toilet tissue.Made up of 4 cushioned layers, Regina Softis combines strength and absorbency with a luxuriously soft feel. Uniquely quilted on both sides of the sheet, Regina Softis gives you extra comfort and gorgeous softness. CAUTION<br>To avoid danger of suffocation, keep this wrapper away from babies & children.